Box Office: Budget: $82 million. Opening Weekend: $13.02 million (2516 screens). Gross: $34.543 million. DVD: Widescreen 2.35:1/16x9; audio English Dolby Digital 5.1, English Dolby Surround 2.0, French Dolby Surround 2.0, Spanish Dolby Surround 2.0, Portuguese Dolby Surround 2.0; subtitles English, French, Spanish, Portuguese, Korean, Chinese, Thai; closed-captioned; single sided - dual layered; 28 chapters; Rated PG-13; 124 min. ; $24.95; street date 1/22/02. Supplements: Audio Commentary Composer Trevor Rabin With Isolated Score; RePet Infomercial and TV Spot; "On the Sixth Day" Featurettes; "The Future Is Coming" Showtime Special; Storyboard Comparisons; Animatics; Production Notes; Theatrical Trailers; Filmographies. During much of the Eighties, Arnold Schwarzenegger and Sylvester Stallone duked it out as the two premiere bodybuilders when it came to box office returns. However, when the decade changed, Sly’s career took a nosedive; except for the decent success of 1993’s Cliffhanger, he would have gone all of the Nineties without a single hit. Although he spent the first half of the decade at the top of the charts with hits like Terminator 2 and True Lies Arnie seems to be on his way to the bottom along with Stallone based on recent efforts. While he neatly rebounded from the failure of 1993’s Last Action Hero with 1994’s True Lies, his next effort - 1996’s Eraser - didn’t tank, but it also didn’t pull in the expected business, and 1997’s Batman and Robin - in which Schwarzenegger played Mr. Freeze - almost killed the franchise. However, the problems with the latter weren’t Arnie’s fault, really, as the blame primarily resided with director Joel Schumacher and a miscast George Clooney as Bats. Nonetheless, the descent had really begun, and it didn’t help that health concerns kept Schwarzenegger off the screen for more than two years. When he returned, the results were less than spectacular. Late 1999’s End Of Days proved to be another financial disappointment as it collapsed among the ruins of other apocalyptic fantasies found in the pre-millennial fervor. Apparently eager to revisit the salad days of a decade earlier, the next Schwarzenegger piece returned to familiar territory: the future. 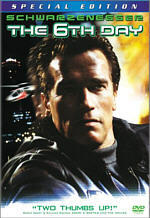 2000’s The 6th Day cast Arnie as a man who runs into problems when he’s cloned. Unfortunately, human cloning is illegal in the “very near future” - when the movie takes place - so the evil corporation behind the activity wants to ice him to hide the evidence. Never mind that boohoogles of other clones walk the Earth, and they each have easily identifiable marks that brand them as copies. You don’t watch a movie like The 6th Day for flawless logic - you check it out to get revved up by the action. With director Roger Spottiswoode behind the camera - the man who helmed 1997’s moderately successful Bond flick Tomorrow Never Dies - 6th Day looked like it might have had some potential. Or maybe not. A glance at Spottiswoode’s résumé shows that in addition to the Bond flick, he also led such classics as 1989’s Tom Hanks embarrassment Turner and Hooch and Stallone’s most infamous work, 1992’s Stop! Or My Mom Will Shoot. Arnie, are you sure this is the guy in whom you want to trust your future? Probably not, and while The 6th Day isn’t a bad movie, it certainly lacks any spark or true excitement. At best, Spottiswoode is a competent director of action flicks. At this point, the Bond franchise is such a well-oiled machine that directors become almost irrelevant; while a good captain might bring out greater thrills in the series, a mediocre one is unlikely to really harm it. Spottiswoode showed no great talent in TND, but he also knew when to get out of the way and let the usual pyrotechnics and danger run their course. In 6th Day, Spottiswoode seems to take a similar approach, but without the solid and established crew behind him, the project founders. This seems like a very generic futuristic action film and absolutely no parts of it do anything to distinguish themselves. Actually, that’s not totally true. Early on, we see a football game played as part of a very successful league. Unfortunately, the filmmakers put their money on the XFL, an organization that barely made it through its first season and is now as dead as could be. Even cloning won’t bring back that disaster! It’s not good when your movie starts with an unintended laugh such as this, and The 6th Day does little to go above that mistaken bet. I like Schwarzenegger as an action hero, but when it comes to playing regular folks, he’s a dismal failure. During much of the film, he has to interact with his wife, his daughter, and his friends, and Arnie simply can’t pull off the natural, warm style required. He seems absurdly - and painfully - phony in those scenes; you just pray for an explosion to get us past his excessive emoting. It also doesn’t help that 6th Day seems to be at least a half an hour too long. When I find myself checking out the time display on my DVD player and thinking “I’ve only watched 40 minutes??! !” I know something’s wrong. I could not resist my urges to inspect the passing minutes, and I constantly could not believe what I saw. When the movie hit the one-hour mark, it seemed impossible that another 64 minutes of story remained. There appeared to be so little left to do that I thought the 124 minute running time listed on the DVD’s case was a mistake. However, it most definitely was correct, and The 6th Day simply plodded along to its conclusion. At least this wasn’t an inevitable conclusion; though many of the plot’s twists appeared predictable, it threw in a couple of surprises that made the movie a little more interesting. But not much, unfortunately, as The 6th Day simply is too slow moving and uninventive to offer a very entertaining experience. On one hand, I’ve definitely seen worse. Despite its lack of spark, at least the movie seemed competently made, and it boasted a fairly good supporting cast including Robert Duvall, Tony Goldwyn and Michael Rapaport. Only the former made any substantial impact, however, as the other two sleepwalked through their generic roles. In any case, The 6th Day was not a terrible movie. However, it was a bland one, and a dull action flick is not a good thing. Honestly, it felt like little more than a mild variation of Schwarzenegger’s 1990 hit Total Recall, as the themes and styles were similar in many ways. However, the latter featured a strong director in Paul Verhoeven; the man makes many missteps, but at least he remains distinctive. The same cannot be said for the very ordinary Roger Spottiswoode. Oh well - perhaps Schwarzenegger will rebound when Terminator 3 hits the screens. The 6th Day appears in an aspect ratio of approximately 2.35:1 on this single-sided, double-layered DVD; the image has been enhanced for 16X9 televisions. As one might expect from a recent, big-budget flick like this, the movie looked consistently excellent, with virtually no flaws on display. Sharpness appeared absolutely immaculate at all times. Even during the widest shots, I didn’t discern a hint of softness or fuzziness. The picture stayed wonderfully crisp and detailed throughout the film. I also witnessed no examples of moiré effects or jagged edges. Print flaws presented no concerns during the movie. I saw no signs of grain, hairs, scratches, tears, grit, blotches, speckles or other defects; it was a nicely clean image. Colors seemed very solid, with hues that appeared accurate and true. The film usually utilized a fairly cool palette, but when it made sense to feature bolder hues - such as during the opening football game or in shots of the helicopters - the tones looked bright and vivid, without any concerns related to bleeding or noise. Black levels seemed deep and rich, and contrast was strong. Shadow detail came across as clear and appropriately opaque without any signs of heaviness or thickness. Ultimately this is an excellent picture that should make viewers very happy. Also fantastic was the Dolby Digital 5.1 soundtrack of The 6th Day. From the second this film began, the mix seemed very active and involving. All five channels provided a tremendous amount of information. The forward speakers dominate - which is natural, since the vast majority of the dialogue comes from the front - but the rears gave them a run for their money; the surrounds kicked in with strong reinforcement throughout the movie and provided unique audio much of the time. Easily the best segments were those that involved the helicopters; especially notable was the first time we see them fly, as this sequence showed off excellent dimensional audio and active split-surround usage. The track offered a wonderfully engaging experience throughout the film. Audio quality also seemed excellent. Dialogue appeared crisp and natural with no signs of edginess or problems related to intelligibility; speech was always distinct and looped lines blended well with the rest of the track. Music seemed bright and rich and provided positive bass, as did the effects. In this kind of film, effects are especially important, and the sound of The 6th Day didn’t disappoint. They blasted realistically and cleanly from all the speakers and provided a dynamic punch. Ultimately, I thought the movie featured a very strong soundtrack that helped make the story a bit more involving. As first announced, the original DVD of The 6th Day was supposed to include a slew of extras. However, the final product skimped on these. Ten months later, we finally have a two-DVD special edition release of the film, and you know what? It’s still a fairly lackluster product. Almost all of the materials found on the old disc reappear here; I’ll mark those with an asterisk. As such, if you don’t see the “*”, assume it’s new to this package. Most of the extras pop up on the second DVD, but the first disc isn’t totally barren. Of main significance is a combined *isolated score and audio commentary from composer Trevor Rabin. Most of the time these programs include the entire score, and the composer speaks in between the music. That most definitely isn’t the case here, however. Instead, Rabin speaks throughout most of the track, and he often talks on top of music cues. In fact, there seemed to be relatively little unaffected score to be found. It’s presented in Dolby Digital 5.1 sound, but this seems somewhat useless because there isn’t much isolated music on the track; even when Rabin doesn’t yak over the score, the volume level remains low and leaves his work in the background. As such, the piece will likely be a disappointment to music fans who want to enjoy Rabin’s score. However, those folks who want to hear Rabin’s musings will be very pleased, as he offers a great deal of interesting information throughout his commentary. He touches on a variety of issues that affect him as a composer and he addresses his goals in that role. Another fun touch stems from his “past life” as a member of Yes; I loved the times when he discussed his experiences in that band, and these elements made the commentary very enjoyable. It’s too bad that so little isolated score appears, but at least the remarks from the composer were very worthwhile. As we move to DVD Two, we find the lion’s share of the supplements. First up is a Showtime featurette called The Future Is Coming. This 15-minute and 30-second program mixes the standard complement of behind the scenes material, clips from the film, and interviews with cast and crew. In the latter area, we hear from actors Arnold Schwarzenegger, Tony Goldwyn, Wendy Crewson, Robert Duvall, Michael Rapaport, Sarah Wynter, Terry Crews, and Rod Rowland as well as director Roger Spottiswoode, producers Mike Medavoy and Jon Davison, executive producer Daniel Petrie, visual effects supervisor Peter Kuran, special effects animator Kurt Wiley, production designers Jim Bissell and John Willett, special effects supervisor Michael Lantieri, and Mark Westhusin of the “Missyplicity Project”, an attempt to clone a pet. Despite the length of that roster, “Future” offers little depth. While it seems to be a watchable program, it always remains true to its promotional origins, so don’t expect anything particularly involving or compelling. Instead, we learn a little superficial material about the movie along with some occasionally interesting behind the scenes footage. Frankly, I would have enjoyed more information about real-life cloning, but since “Future” exists to promote the film, I guess I should be happy with what I got. Next we find a collection of nine featurettes in an area titled On the Sixth Day. All told, these add up to about 48 minutes of material. This department starts with Another Way to Fly. The four-minute and 40-second piece focuses on the effects behind the film’s Whisper-Crafts. It and all of the following pieces will mix movie clips, behind the scenes material - including some raw effects shots - and interviews. For “Fly”, we hear from Bissell, Lantieri, visual effects producer Karen Murphy, and computer artist Rpin Suwannath. The program offers some moderately interesting information about this side of the film, but overall it seems a little flat and generic. More interesting is the next featurette, the seven-minute and 45-second Finding Sim Pal Cindy. It examines the creation of that “living doll” and we get remarks from hairstylist Melina Calogiros as well as Tom Woodruff Jr., Alec Gillis, Dave Penikas and Mark Hull of Amalgamated Dynamics, the crew that invented the animatronic. Overall, this is a fun little piece that gives us a fairly solid examination of this part of the process. Another decent but unspectacular program appears next with the six-minute The Art of the Chase. It gives us notes from second unit director Jim Arnett and Lantieri as it relates the details of a car chase. I liked Arnett’s discussion of the second unit’s responsibilities, but otherwise the piece lacked much depth. Some of the behind the scenes shots were reasonably good, however. In Over the Cliff, we discover a three-minute and 28-second look at a stunt car jump. It includes comments from production manager Brent O’Connor and Spottiswoode. This one seemed a little stronger than some of the others as it discussed the logistics involved. I especially liked the emphasis on the environmental regulations that required them to change the car. For Virtual Girlfriend, we find a four-minute and 29-second program about the effects that allowed Hank to interact with his literal fantasy girl. It includes statements from Murphy and Wiley as we get a fairly detailed look at the work that went into those scenes. It’s one of the more compelling featurettes. In the Tank gives us six minutes and 35 seconds of material about the film’s big set and its water tank. We hear from Willett, Schwarzenegger, and dive supervisor Jeff Bough. Another somewhat mediocre piece, this one offers some decent shots from the set but seems a little dull as a whole. Next we get Freefalling, a three-minute and 18-second examination of a stuntman’s rapid descent. It includes remarks from Arnett and effects rigging coordinator Corbin H. Fox. This is another solid segment as it details the preparations and work that must go into ensuring safety during this sort of stunt. Given its title, one might expect Detonation to cover explosives, and that’s exactly what the three-minute and 43-second program does. It gives us notes from Gene Warren Jr. of Fantasy Film Effects and Joe Viskocil of Viskocil Effects as they offer a reasonably solid look at various pyrotechnics. Finally, Enhancing the Look offers a more general eight-minute and five-second examination of various visual improvements made to the movie. It includes remarks from Murphy, visual effects supervisors David Drzwiecki and Tom Smith, and Spottiswoode. The program’s main emphasis is on the double-Arnie shots, and it nicely covers how those were created as well as some minor touch-ups. “Enhancing” ends the featurettes on a positive note, but overall, they seem generally interesting but nothing terribly special. During “Another Way to Fly” we saw some examples of animatics, and a separate area on the DVD offers lengthier versions of those snippets. We get clips for two scenes: “Snowy Mountain” and “Rooftop”. The former consists virtually entirely of crude computer animation and runs two minutes, 40 seconds, while the latter more liberally mixes CGI with storyboards and lasts three minutes, 28 seconds. Both are interesting diversions but nothing spectacular. Additional planning materials appear in the Storyboard Comparisons domain. We get art and film for three scenes: “Car Chase” (4:09), “Whisper-Craft” (1:21) and ”Cloning Tanks” (2:21). These present the boards in the top half of the screen and the movie runs in the bottom. They should be interesting for those who like that sort of thing, but I’m not a big fan of boards, so they did little for me. In the “fun” category are the two *RePet ads we discover on the DVD. One of these is the “infomercial” seen briefly at the RePet store, while the other shows the TV ad we see. Both offered in their uncut glory, the former runs two minutes, 35 seconds, while the latter clocks in at 45 seconds. It was great to get to watch them uninterrupted; more DVDs are adding features like this, and I appreciate it. A few minor pieces round out the DVD. We find the film’s *theatrical trailer; it’s presented in anamorphic 1.85:1 with Dolby Digital 5.1 sound. In addition, we find clips for Final Fantasy: The Spirits Within, Jet Li’s The One, and the upcoming theatrical release of Spiderman. As with the ad for 6th Day, all are anamorphic with DD 5.1 sound, except for the non-anamorphic 1.85:1 Spidey. Lastly, we get Filmographies for director Spottiswoode and actors Schwarzenegger, Goldwyn, Rapaport, and Duvall; oddly, these omit even the usual extremely perfunctory biographies found in the original DVD’s “Talent Files”. The DVD’s *booklet also tosses in some short but solid production notes. Note that although the original disc included some weblinks and this one’s case mentions them, I found no evidence of such DVD-ROM content here. As a whole, The 6th Day offered a watchable but overly long and bland action film. It wasn’t a bad flick, but it failed to engage or excite me much and I thought it seemed relentlessly mediocre. The DVD, however, provides absolutely excellent picture and sound, and we also find a very good audio commentary among some other decent extras. For Schwarzenegger fans, The 6th Day might merit a look, but others should probably stick with more distinctive and compelling material. What about those folks who already purchased the original 2001 DVD - should they “upgrade” to this one? In my opinion, no. The new features on this special edition are reasonably interesting, but I don’t think they add a lot to the package. For fans who never grabbed the first one, the special edition is the way to go, but owners of the original will probably be content to stick with it. To rate this film visit the original review of THE 6th DAY.